The morning sun creeps over the horizon and peeps through the leaves, waking Senzo. Gogo’s rooster shakes his wings, stretches his neck and crows, Koek-a-loek-a-loo! 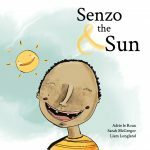 Join Senzo and the sun as they journey through the day. 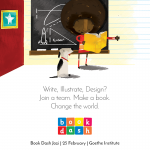 Created at Book Dash Jozi on 25 February 2017 by Sarah McGregor (writer), Adrie Le Roux (illustrator) and Liam Longland (designer). Edited by Elise Varga. This event took place at the Goethe-Institut Johannesburg on Saturday, the 25th of February 2017. It was sponsored by the wonderful people at Worldreader. The Goethe Institut generously made it possible for six writers and six illustrators from different African countries to participate in this special event. Book Dash is a registered voluntary association.